Well, I am at it again, looking for that ultimate in a laptop messenger bag, and this time I turn to Crumpler’s “The Cashmere Blazer.” This is the showpiece of Crumpler’s bags, and I must say, this bag is amazing and beautiful. I was again looking for a messenger bag with a more “professional” look, one I could easily carry into the office and not get kidded about bright orange florescent colors blinding everyone as I rode in the elevator or walked down the hall (not that there is anything wrong with that!) The black version of this bag, which has been so popular that I had to wait almost 6 months to try one, is a beautiful piece of engineering. With black front, back and bottom and sides of dark green, this bag will work well in a professional environment as well as a casual setting. By the way, if black is not your thing, relax, this bag is available in two tone red, blue, beige, and brown as well. The first thing I noticed about the Cashmere Blazer was just how big this bag really is. This size might not be for everyone, but if you need to carry a LOT of stuff, this will do it. (If you carry less or have a smaller computer, consider The Horseman, a smaller version of this bag.) At 17.5” by 17.5” by 8”, this is one BIG bag. It actually has a capacity (volume) of 20 liters! The laptop pocket inside is 15.7” x12.6” x 1.6”, which will easily hold a 17” MacBook Pro or Powerbook, or a smaller computer and a few accessories IN the well-padded pocket. The rest of the bag will hold a boatload of other things with room to spare. Unfortunately, it was also very easy to fill up this bag, making it to heavy to comfortably carry too. To get the rest of the technical specs out of the way, it is water resistant, made of 1000D Nylon shell and 420D Ripstop Nylon lining. 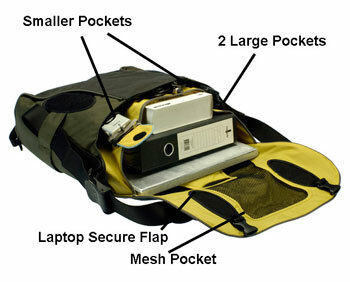 It has fully padded main and laptop compartment, and has plenty of pockets and compartments. In my water tests, everything inside stayed completely dry. On the downside, ALL pockets and compartments are inside, an oversight in my opinion, as missing are my always desired outside pockets for glasses, water bottle, or a cell phone. This bag will require you to open it to get at your stuff, not so easy when riding a bike. A large flap closes over the front all the way to the bottom and secures with both Velcro pads and two snap clips. There is a large mesh, zippered pocket on the inside of this front flap, but adding too much stuff here made the flap hard to manage. Inside the bag, there is the previously mentioned laptop sleeve along the back, and it does not remove. A large Velcro flap holds your computer securely in this pouch. In front of that is the first of three large pockets running full length and height of the bag. A full height and width divider creates the second full sized pocket in front of the previous one, meaning that unlike some bags, you do not have just one large cavernous pocket into which everything falls and disappears. On the front side of this last divider are three various sized pockets with Velcro closing flaps. On the front facing side of this front main pocket are two smaller pockets with Velcro pads (no flap) that close them at the top. All these pockets and dividers make sorting and finding stuff in this bag easy, until it gets very full. In addition, unlike so many other black bags, the inside pockets are actually a mild shade of yellow, making it much easier to see things inside the pockets, even the largest ones. But wait, there is more! I did say three large pockets, didn’t I? Hidden between the front main pocket and the front of the bag is yet another full sized pocket with a zippered top. I say hidden because this one is hard to see at first glance, as the main pocket’s top edge tends to hide the zipper. Opening this zipper reveals the third full sized pocket, with two more Velcro closing pockets, 3 pen holders, and another smaller zippered pocket along the back wall, again all lined in yellow. Basically, if you cannot find a way to organize all your stuff in this bag, you should just give up now, as I have not see a better solution in a messenger bag as most are just one big, dark, black hole. 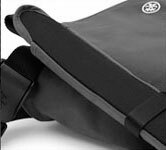 Unlike Timbuk2, a shoulder strap pad is included, so there is no extra padding to buy to make the strap comfortable. It has a long, wide, adjustable strap with a Quick Flick™ buckle. This looks a lot like a seatbelt buckle on an airplane. You lift up the flap and slide it to tighten or release the strap, and press it back down to lock it. Unlike the buckle on Chrome’s bag (http://www.mymac.com/showarticle.php?id=1980) , there is no large button in the front beckoning someone to walk up and press it (which several people did to my Chrome bag, causing the bag to fall off my shoulder!) 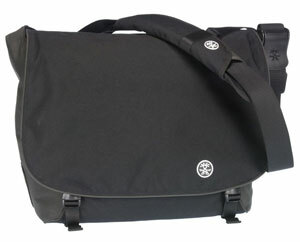 This bag is easy to use over either shoulder as a messenger bag, or easily carried as a shoulder bag. The strap also has a “third leg” stability strap that slides along the main strap and connects to a buckle on the back left of the bag. But I was never quite sure why I wanted to use this, or how it helps. Missing from this bag is a handle at the top for picking up and carrying by hand for short distances. Maybe the bag’s large size and thus the greater possible weight made a handle difficult to add without concern of it tearing off? Still, in day-to-day use, I found that feature missing. Given this size of this bag, the addition of pads on the back much like bbp does would have been a welcome addition as well. Because of the bag’s carrying capacity, it becomes very heavy as you load it up. It seems if there is room inside, I kept putting stuff into it, and it kept getting heavier. With it riding on the back, the extra weight digs into the back more than usual, and extra padding would have helped greatly here. As I said above, there are NO pockets anywhere on the outside of the bag. Maybe I am unusual in this desire, but so far only bbp and Timbuk2 have gotten this correct in my view. As I ride or walk with the bag, I do not want to have to take it off and open it to find my glasses, a water bottle, or my cell phone. Crumpler does sell a phone pouch (The “Thirsty Al mobile phone holder”) that attaches to the outside of this bag or strap, but that is a partial, additional cost solution at best, and only helps for one thing, the phone. In fact, there actually is no real good place in this bag to properly hold a water bottle, which forced me to toss it inside, and later that day, much of my stuff was wet from the bottle sweating inside. I do not understand this really; don’t messengers ride bikes? Don’t they need to get at their water easily? Using the bag was straightforward with no complex straps and buckles to reconfigure as I found on bbp and Chrome bags. The over the shoulder strap with buckle was simple to use. On the front flap are the two common plastic buckles, which, when the flap is closed, are secured by two straps with a matching buckle; not really needed here because the flap stays closed firmly with Velcro anyway. All the small issues aside, this now rates second among all the messenger bags I have tried to date. Granted, it is WAY too big for my needs now that I carry a 12” Powerbook (Apple, please, a 12” MacBook Pro), so I am curious to try the smaller Horseman bag as something more manageable for my needs now. If they would add a few outside pockets along the edges, this would be the ultimate messenger bag for me. A solid 4.5 out of 5 for me.